Numerous effects including change speed or pitch and vocal reduction or isolation (given suitable stereo tracks). 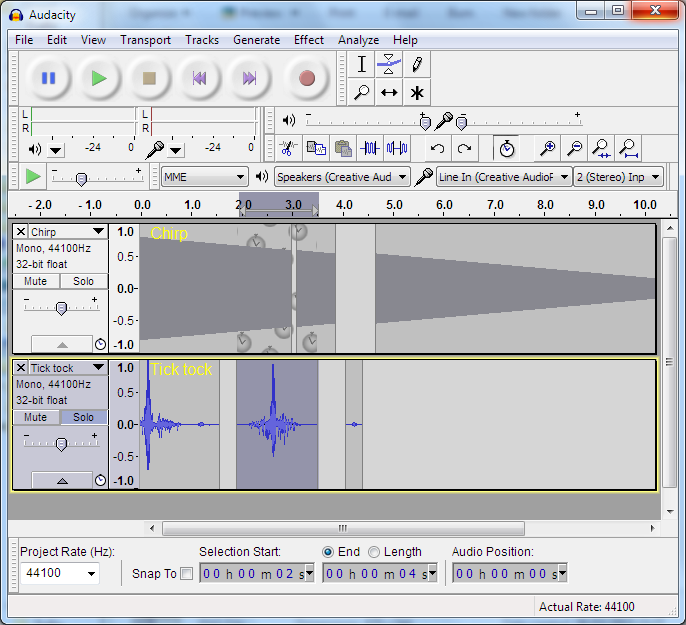 Audacity can record live audio through a microphone or mixer, or digitize recordings from other media. With some sound cards, and on any recent version of Windows, Audacity can also capture streaming audio. Device Toolbar manages multiple recording and playback devices. Level meters can monitor volume levels before, during and after recording. 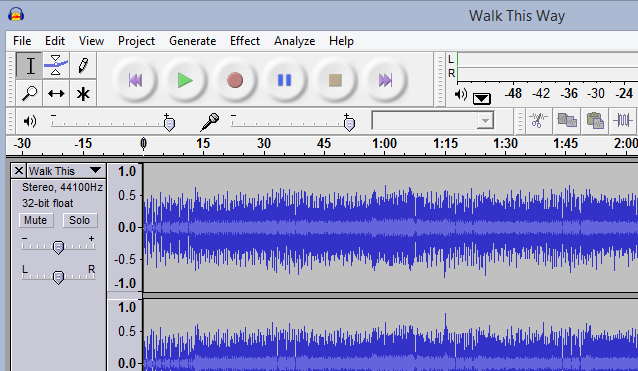 Clipping can be displayed in the waveform or in a label track. Record from microphone, line input, USB/Firewire devices and others. Record computer playback on Windows Vista and later by choosing "Windows WASAPI" host in Device Toolbar then a "loopback" input. Timer Record and Sound Activated Recording features. Record at very low latencies on supported devices on Linux by using Audacity with JACK. Record at sample rates up to 192,000 Hz (subject to appropriate hardware and host selection). Up to 384,000 Hz is supported for appropriate high-resolution devices on Windows (using WASAPI), Mac OS X, and Linux. Record at 24-bit depth on Windows (using Windows WASAPI host), Mac OS X or Linux (using ALSA or JACK host). Record multiple channels at once (subject to appropriate hardware). Import sound files, edit them, and combine them with other files or new recordings. Export your recordings in many different file formats, including multiple files at once. Import and export WAV, AIFF, AU, FLAC and Ogg Vorbis files. Fast "On-Demand" import of WAV or AIFF files (letting you start work with the files almost immediately) if read directly from source. Import and export all formats supported by libsndfile such as GSM 6.10, 32-bit and 64-bit float WAV, RF64, and U/A-Law. Import MPEG audio (including MP2 and MP3 files) using libmad. Import raw (headerless) audio files using the "Import Raw" command. Create WAV or AIFF files suitable for burning to audio CD. Export MP3 files with the optional LAME encoder library. Import and export AC3, M4A/M4R (AAC) and WMA with the optional FFmpeg library (this also supports import of audio from video files). Supports 16-bit, 24-bit and 32-bit (floating point) samples (the latter preserves samples in excess of full scale). Easy editing with Cut, Copy, Paste and Delete. Unlimited sequential Undo (and Redo) to go back any number of steps. Edit and mix large numbers of tracks. Multiple clips are allowed per track. Label tracks with selectable Sync-Lock Tracks feature for keeping tracks and labels synchronized. Draw Tool to alter individual sample points. Envelope Tool to fade the volume up or down smoothly. Tracks and selections can be fully manipulated using the keyboard. Large range of keyboard shortcuts. Excellent support for JAWS, NVDA and other screen readers on Windows, and for VoiceOver on Mac. Real-time preview of LADSPA, VST and Audio Unit (OS X) effects. 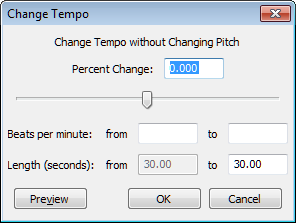 Change the pitch without altering the tempo (or vice-versa). Remove static, hiss, hum or other constant background noises. Alter frequencies with Equalization, Bass and Treble, High/Low Pass and Notch Filter effects. 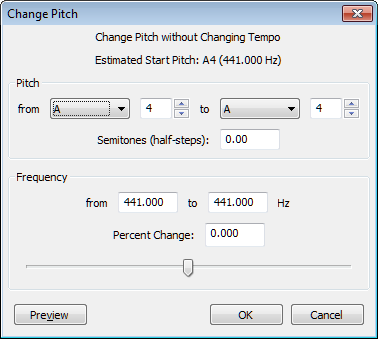 Filter a frequency selection made in Spectrogram views or Spectral Selection Toolbar using spectral edit effects. Adjust volume with Compressor, Amplify, Normalize, Fade In/Fade Out, Crossfade, and Adjustable Fade effects. Remove Vocals from suitable stereo tracks. 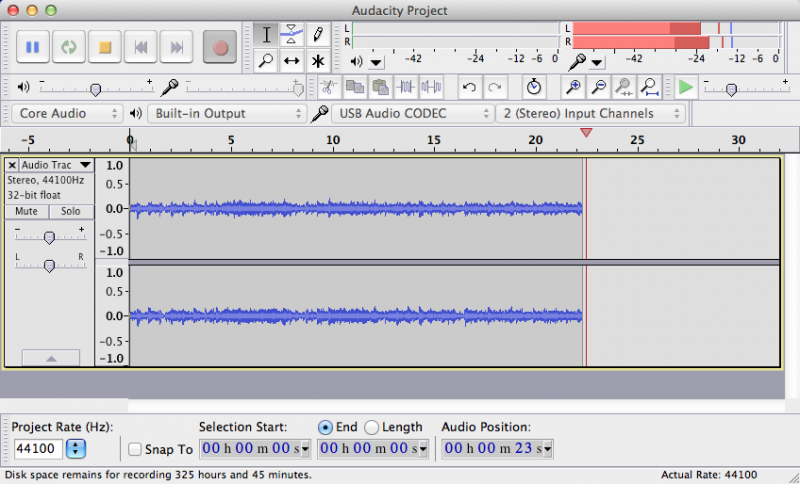 Create voice-overs for podcasts or DJ sets using Auto Duck effect. Run "Chains" of effects on a project or multiple files in Batch Processing mode. Support for LADSPA, LV2, Nyquist, VST and Audio Unit effect plug-ins. Effects written in the Nyquist programming language can be easily modified in a text editor - or you can even write your own plug-in. Spectrogram view modes for visualizing and selecting frequencies. "Plot Spectrum" window for detailed frequency analysis. "Sample Data Export" for exporting a file containing amplitude values for each sample in the selection. Contrast Analysis for analyzing average RMS volume differences between foreground speech and background music. Support for adding VAMP analysis plug-ins.